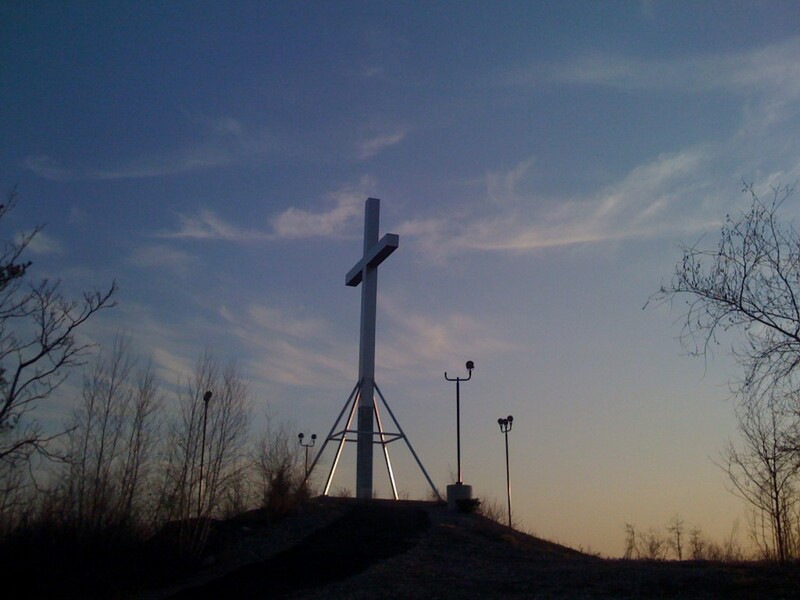 There is a cross atop a hill in Waterbury, Connecticut. 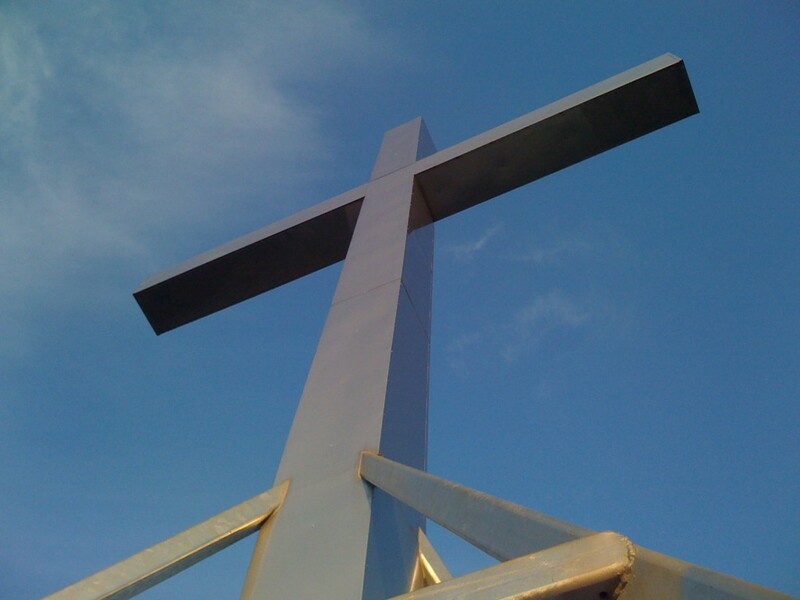 The cross is fifty feet tall and made of steel. 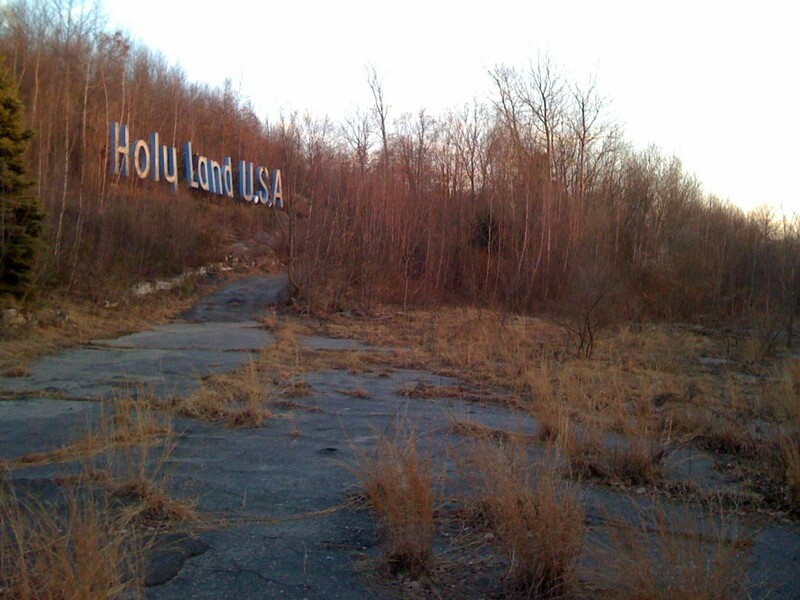 Below it, ten-foot-tall neon letters spell out HOLY LAND U.S.A, a ‘testament’ to the religious amusement park, now closed, that occupies the site. The sign and the cross are still illuminated at night, the electric bill paid by the two nuns who live next to the property. 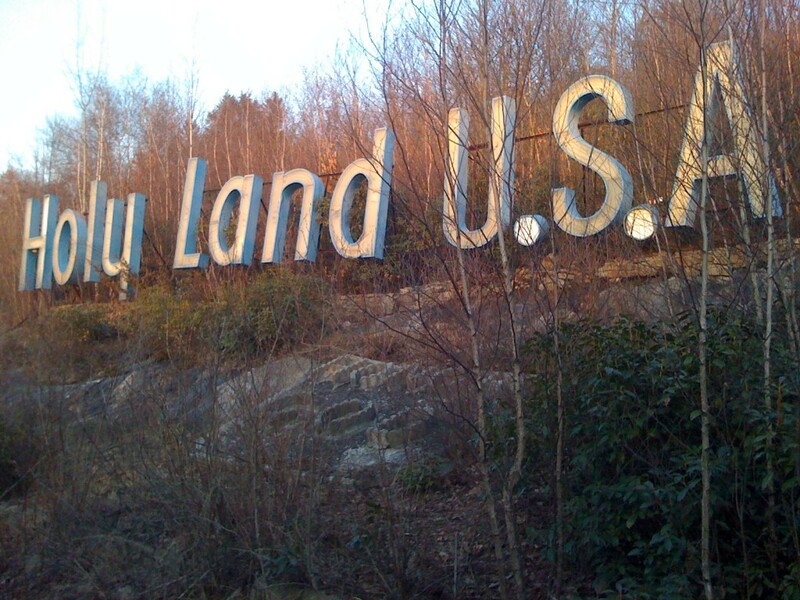 Holy Land was an amusement park, built in the mid-1950s by a local lawyer named John Greco; the park was aimed at educating visitors in Christian doctrine by showing them scenes from the life of Christ. Holy Land did not have rides or roller coasters — just an earnest desire to teach. This lofty goal was accomplished with simple materials — plaster, concrete, plywood, and tin siding. 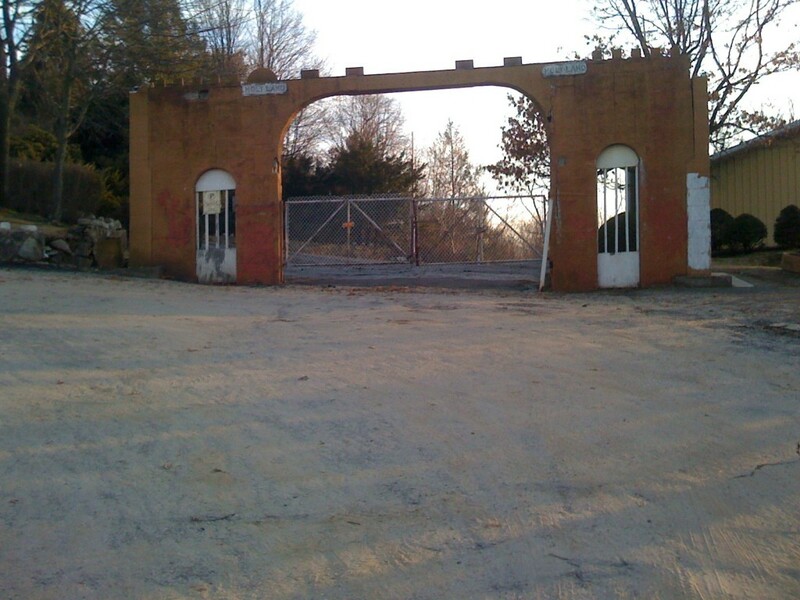 Since its closure in 1984, the park has slowly crumbled to become a ruin of religious proportions. The entrance to Holy Land. The wood-and-plaster architecture is found throughout the park, as is the faux-ancient-Palestinian style. Jerusalem in miniature. Each building is between eight and twelve inches tall. Just inside the entrance is a set of archways, labeled “Holy Land — Jerusalem.” These lead to the heart of the park, a rocky hill covered in miniature buildings. It feels like the type of thing your wacky uncle might build in his backyard. The buildings, most made of plaster and wood, are meant to represent Jerusalem as it existed during the life of Jesus Christ. The original installation used a crude version of forced perspective, placing larger buildings closer to the path. This building is about three feet tall. The park seems to maintain a fine balance between between sincerity and kitsch: A building next to the path, about the size of a large doghouse, has caved in on itself. Across its front, the letters spell out “HEROD’S PALACE,” but the style of the letters suggests something your father might have picked up at the corner hardware store to nail the family name above the front door; really, that describes most of the park. The tiny buildings are pieced together from plywood. Tin siding has been bent into columns, then crudely covered with plaster. House paints, in mid-20th-century colors, have transformed a motley collection of tiny shacks into a vision of the Middle East. Of the Holy Land. The stainless-steel cross is different. In a clearing at the top of the hill, beyond the crumbling Jerusalem, it feels clean and no-nonsense, an architecture reminiscent of US military bases and mid-century hospitals. The welds are precise, the angles sharp. It is also new, the second such cross to crown the site. Its predecessor, replaced last year, was six feet taller and made of neon, but both were meant to last. 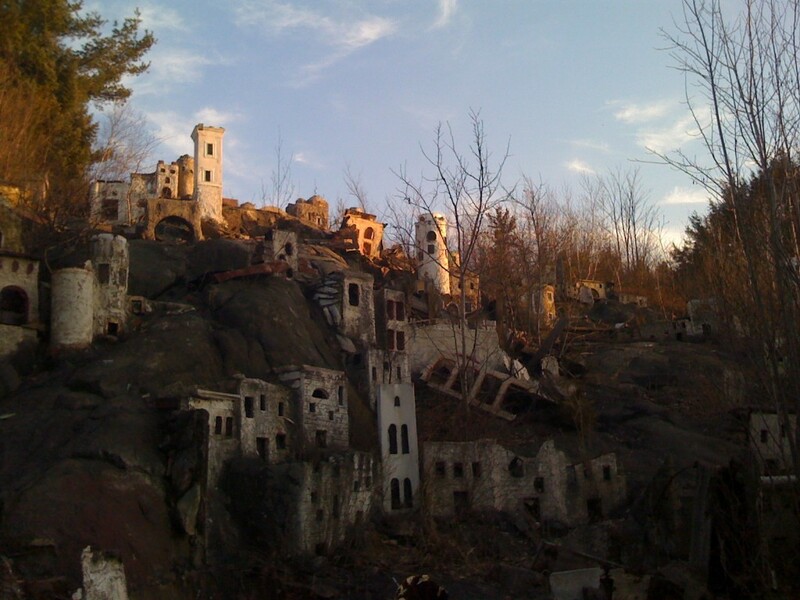 They towered above Waterbury and were visible from the highways–I-84, CT-8–that pass beneath the park. From the top of the hill, Waterbury and the Brass Mill Mall stretch out beneath you. The Hollywood-style letters were also renovated, by Boy Scouts in 1997. Together, the cross and letters burn bright in Waterbury’s night sky. That’s the paradox of Holy Land. 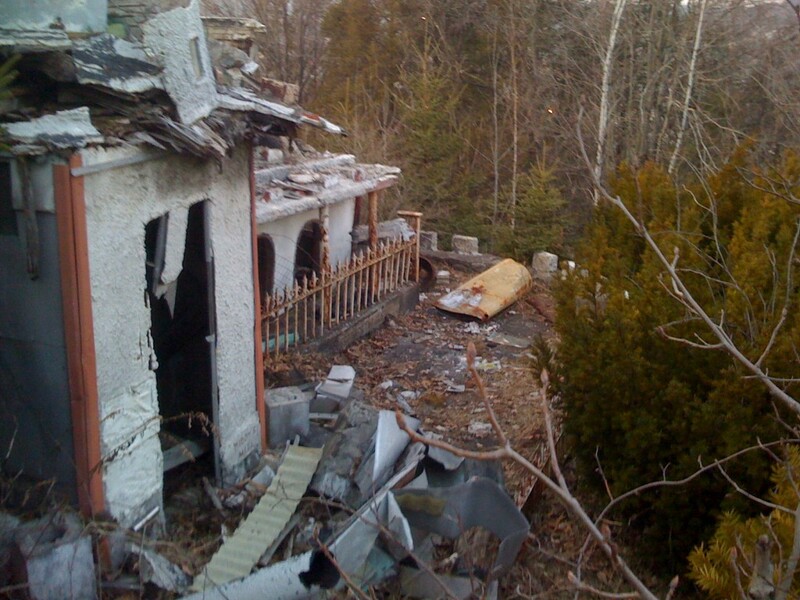 It is abandoned, derelict, and falling in on itself, but still able to summon compassion and care from those around it. Every attempt to demolish the park has brought protests. The cross and letters remain lit at night because they are a local icon, a vital part of Waterbury. We spent about 40 minutes in the park and left just after sunset. It’s a small park. It is also decaying quickly. The miniature sphinx visible in various photos online has lost its face. A life-size tin statue of Jesus holding a lamb has been lopped off at the shin, the upper part of His body now gone. 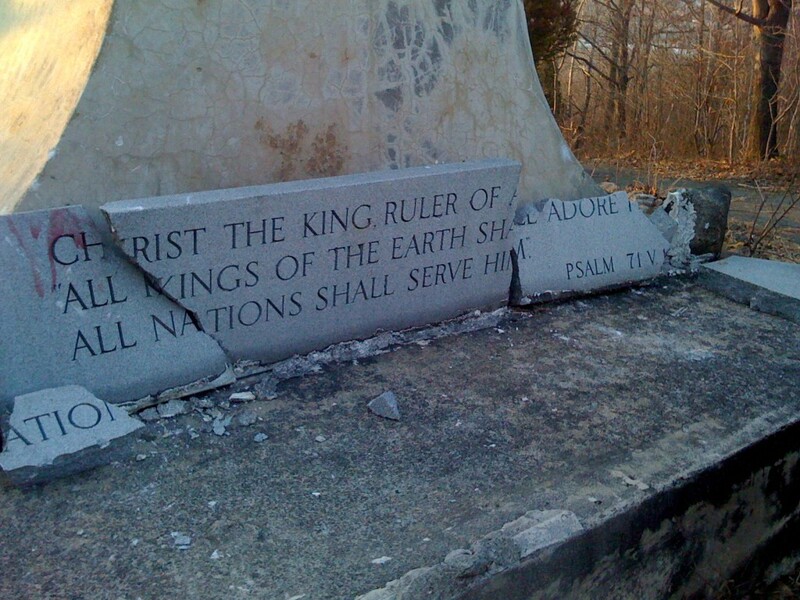 The concrete rock garden built by Boy Scouts barely a decade ago–HONOR GOD, it used to read–has been vandalized, so that it now reads HONOR COD. Inside the park, there are few hazards beyond underbrush and pricker bushes. The paths, like the rest of the park, are overgrown, and trash–mostly beer cans–abounds. The park’s existence is no secret, and it seems especially popular with local teenagers. Holy Land is gone, but not forgotten. 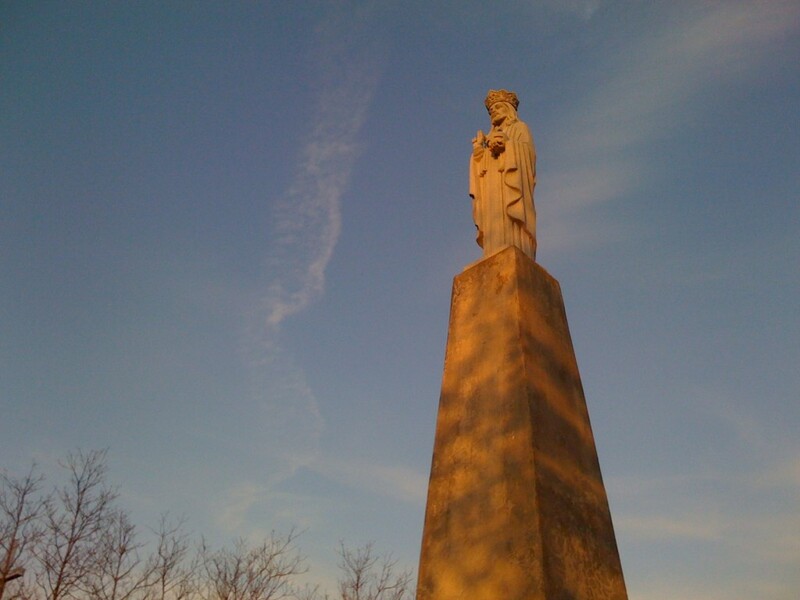 People still care about the park–the nuns with the electric bill, the Boy Scouts who replaced the sign, the photographers and explorers who still frequent its grounds. I’d like to be able to pin an adjective on my experience, to summon a word that encapsulates the park. But I can’t, really. The park wasn’t creepy, wasn’t thrilling. It had none of the drama or tragedy of Six Flags New Orleans. Despite the decayed statuary, there was nothing about it that summoned “Ozymandias.” Mostly it felt innocent. It is one man’s loving paean to a religion. It is a material hymn sung to Jesus Christ. Roadside America has an entry on Holy Land, including photos and instructions for getting there. Two relatively recent New York Times articles, here and here, detail the ongoing plans to save or restore Holy Land. Roadtrip Memories has excellent collection of vintage photos of Holy Land, including construction shots. More vintage photos and postcards are in this Flickr set. 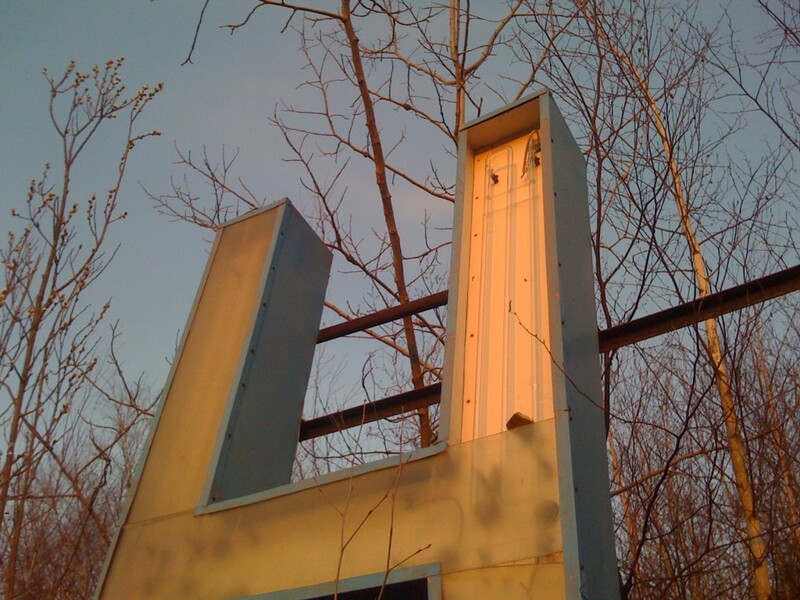 This entry was posted on Wednesday, April 8th, 2009 at 6:07 pm	and is filed under Built Environment, Geography in the Media, Industrial, Must See Geography, Roadside Architecture. You can follow any responses to this entry through the RSS 2.0 feed. You can skip to the end and leave a response. Pinging is currently not allowed. A fantastic look inside Holy Land, U.S.A. It’s so interesting (and often scary) to see what happens when people simply move out. Very interesting to look at the culture left behind. I really enjoyed this, thanks for posting! i grew up in waterbury, as my father, and his parents did..
holy land was a place we went to almost every sunday after church. i am sick and quite saddened to have seen this go downhill and crumble apart through the years.. i remember a few years ago they were talking on bringing it back to life and restore. i wonder what happened to this, i am sure it fell through, like the last few mayors. how sad and a shame i never got the chance to take my girls to this beautiful place, how i loved to go there. if ever they do a cleanup, i would be the first to sign up. they say that as far as the eye can see on highway 84, there has never been a car accident or breakdown in front of that cross. i can say first hand just how spotless and peaceful it was. and the flowers in the summer were beautiful. Yeah, this is interesting and all, but a girl got raped and murdered right underneath one of the giant scary crosses at that park. Gonna cross this off my list of “Godly” places to visit. Church, community leaders and all interested, will be meeting at the Silas Bronson Library auditorium tonight at 6pm to discuss preserving Holy Land for the Christian community and the corporate opportunity for churches to work together on this very unifying project. Please pray that God’s will be done and for wisdom to understand the very unique planning process. For more information, please contact Peter O’Neill @ (203) 574-3075 – contactoneills@aol.com. I have been there just recently. My husband and I would like to get a committee together to start raising money to purchase and reburbish Holy Land and to make it something that the community will benefit from. Perhaps a Christian Conference Center, a Summer Camp, thinkgs of this nature. Contact me should you be interested in getting together on this! Let the people take the lead and get this project done! If they want to renew this place and need help to work in there let me know hope that the love of God bring back the faith in waterbury and Connecticut. Count on my help … God Bless You Guys..!! Sean Fraga is a junior American Studies major at Yale University and the author of the blog This Material World.